Iris brevicaulis is the first. Better known as Zigzag Iris, this beautiful purple Iris will bring an aire of refinement to your wild growing garden. Zigzag Iris can grow hardily throughout the entire USA and is winter hardy. It's one drawback is that it's foliage tends to lie on the ground, but that does not detract from the beauty and elegance of the flower itself. The sturdy petals provide a perfect landing pad for the heavy-bodied bumble bee. The flowers emerge in June and the bulbs do especially well in wet areas, thus it's recommendation for the rain garden. 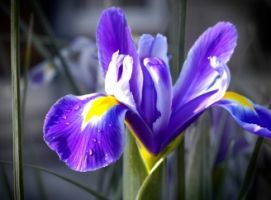 This plant likes full sun, but partial shade is okay, so don't hesitate if your other flowers overshadow this Iris a bit. Iris virginica is another rain garden bulb. Better known as Southern Blue Flag, this Iris is truly a blue flag of beauty. Originally native to marshes and stream sides this Iris is a must for any rain garden. The Southern Blue Flag flowers a little earlier than Zigzag Iris, May through July. Like Zizag, Southern Blue Flag will do okay in part shade, but prefers full sun. Southern Blue Flag grows well east of the rockies, throughout much of the United States. Iris fulva or Copper Iris is the last. This beautiful red Iris grows up to three feet tall and grows early in the spring. Copper Iris attracts hummingbirds and has become rare here in Missouri. Other than Missouri Iris Fulva can grow throughout Texas and eastward to the coast in the southern states, even all the way down into Florida. Habranthus tubispathus is also known as H. texana or H. taxanus. However, for simplicity's sake Texas Copper Lily is its common name. This is a rare rain garden bulb, but beautiful. It's yellow flowers bring sunshine to the garden. Texas Copper is also known as the Copper Rain Lily , and as can be inferred grows throughout Texas. Lilium pardalinum is also known as the Leopard Lily is its common name, but it is also referred to as Panther Lily. Leopard Lily can grow in a variety of soil types and shade cover. It grows fairly tall, up to 3 feet. Lilium pardalinum grows to the far west of California and up into Oregon. This wildflower's primary pollinator is the hummingbird and was listed as endangered in 1997, so not only will including this flower in your garden help to give it a second chance at survival it will attract the native wildlife. Camassia Quamash is the third vibrant member of the lily family, growing from an egg-shaped bulb. It's common name is Indian Hyacinth or Camas. Camas enjoys full sun to part shade and obviously tolerates flooding well. This bulb was once eaten by the Native American's and regarded as a delicacy. Daylilies have also been recommended for rain gardens and there are many species to choose from. Blue Camas , as it is also known has also been used medicinally. Finally, there is one Canna recommended for your rain gardens. Canna flaccida is better known as Swamp Canna and grows mainly in the Southwest and southern Florida. It boasts large leaves reminiscent of the banana plant to which it is related. Canna flaccida is also known as Yellow Canna for its brilliant yellow flowers. This beautiful flower grows up to five feet tall.